I'm not one to hang onto envy for too long. 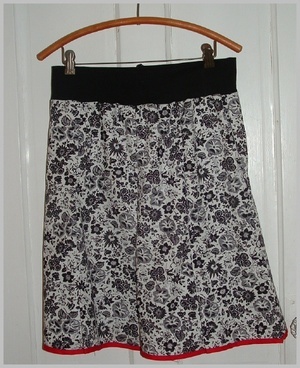 So here are the skirts I made after posting last week about all the gorgeous skirts I keep seeing around. 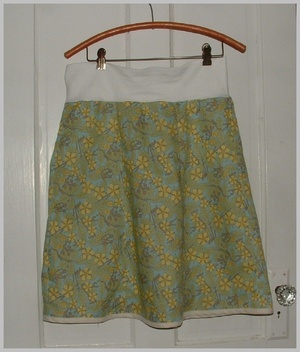 And skirt #2, which conveniently matching this bag I made a week ago. (I promise, I won't wear them together). You can't really tell from the photo, but I made each of the gores (7, again..what the ??) flare a lot, so they each pleat at the bottom. Love that. Oh, and I have to share my new obsession ('cause you know, I need a new hobby). I just got these super cute veggie embroidery patterns from Sublime Stitching (home of the Stitch It Kit). And what better time to start in on them than during a three hour long Survivor fiesta? (Ian stole my heart, by the way). I have one more fruit to go, then I might use them with some Munki Munki farmer's market fabric for a baby blanket. Yum! !